This is the most fantastic piece! The long oak stand was designed by Jacques Adnet during the Art Deco period. It has a round end and oak back and a fitted chrome rail. 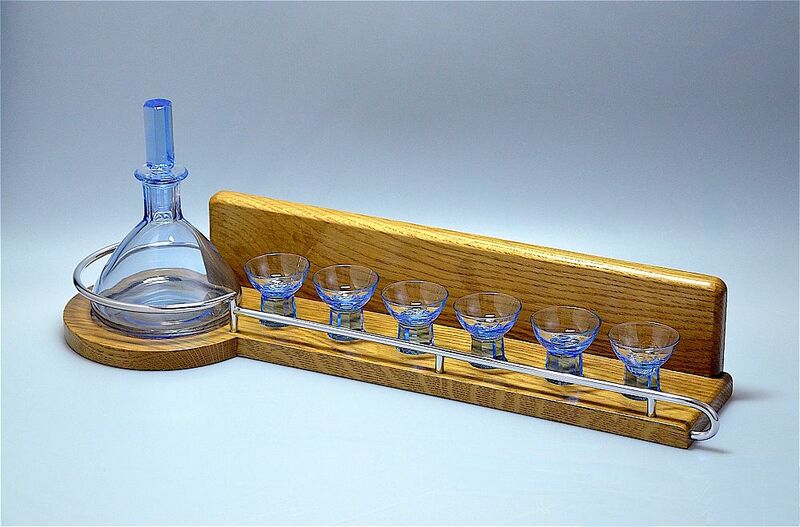 The oak has been turned so that there are shallow "compartments" for a decanter and 6 glasses. The bell shaped blue decanter has a long hexagonal shaped top and is accompanied by 6 blue liquor glasses that have a round bowl and an octagonal shaped stem/base. The decanter and glasses are all marked "Mazolay" which I understand is a name used by G Marquet, Veuve et Fils, Verreries SA. a company that has been in existence since 1666.